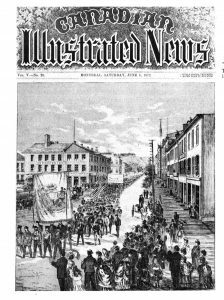 Despite firm opposition from employers, Hamilton’s Nine-Hour League held a huge parade through the centre of Hamilton on May 15, 1872. Roughly 1,500 workers marched past the factories and workshops that had brought the Industrial Revolution to the city. Each craft marched as a unit, as the men held up the tools of their trade and the products of their toil. They carried banners with slogans like “Art is long, life is short.” Everywhere they marched that day, thousands of people cheered them on from crowded sidewalks. 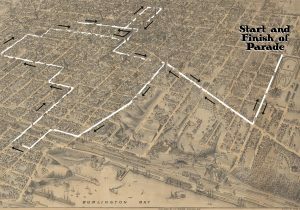 The procession followed a circuitous five-mile route that took marchers past the factories of the many employers who had granted the nine-hour day, and those who had not. 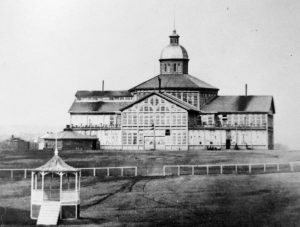 The parade concluded at the Crystal Palace grounds (present-day Victoria Park), where the rest of the day was spent by marchers, families, and friends listening to speeches, and enjoying food and dancing into the evening hours.